Macaroni and cheese is a very personal thing for me as it should be for most people. When you serve someone mac and cheese you are inviting them into your soul. If said mac and cheese is from a box, you are displaying your lack of soul. But if it’s the bubbling stuff that comes fresh out of the oven well then you’ve clearly got soul. And while this piece is about the fine mac and cheese dishes I’ve experienced around the Tampa Bay area, I must say that all adults should at least TRY to make mac and cheese one time. It’s a simple and delicious dish that uses about seven ingredients and requires you to do little more than know how to boil pasta and open and close an oven door. Seriously the oven does MOST of the work. Just TRY this recipe from the New York Times, it’s six ingredients. This is a $10 “side” dish that gives you about $1,000 worth of value in taste alone. Between the four-cheese sauce that includes the house made Pale Ale to the succulent blue crab on top of the shell pasta and the panko crust with Parmesan and Romano. This thing is wicked and one of the few dishes that I truly believe every resident within 30 miles should have before they perish. 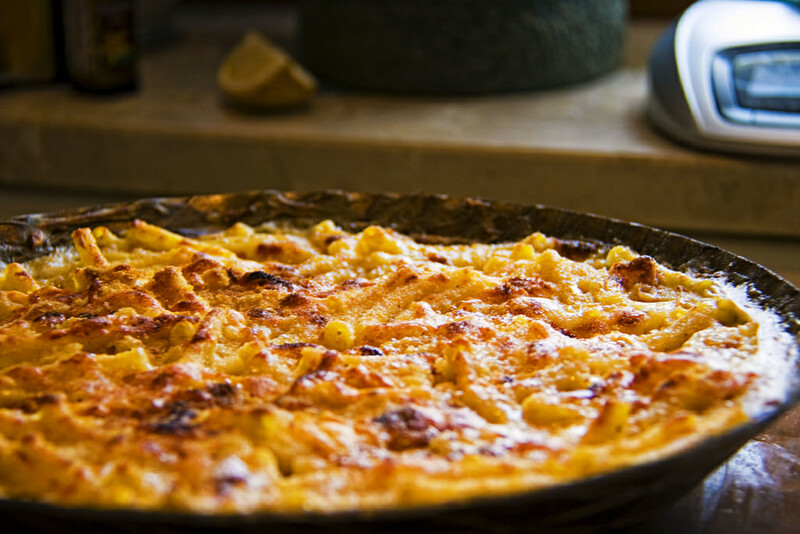 Earlier this year the Blind Goat changed their menus and added three mac & cheeses. I’ve had the buffalo chicken mac ($9) and the bacon mac ($9) and I’d recommend both. Buffalo chicken and bacon can do no wrong. As a matter of fact I wonder why they aren’t paired together more. The good thing is if you want a buffalo chicken & bacon mac you could probably get it here (for an extra charge I’m sure) because they have the ingredients on hand. A meatless mac is available for $8 and I’m sure it’s great too. This dish has won many awards from local publications and for good reason. They use smoked gouda, parmesan and cheddar and no one flavor overpowers the next. It’s not a meatless dish as there is shaved prosciutto. It doesn’t bother me because I eat meat and once that cooked-to-order dish comes hot and fresh in the little cast iron skillet it’s going to disappear quickly in my belly. My man Ray Milton at Ray’s Vegan Soul serves up a delicious mac and cheese that doesn’t use cheese or milk or anything else vegans don’t like to eat. I think he told me the “cheese” is done with some sort of cashew thing...oh well he can explain it. Try everything else there as well because it’s all good and Ray even convinced me to go vegan for a few weeks. You’ll have to be quick to catch the former pro boxer because he’s only open a couple of times a week (usually Fridays and Sundays but check the Facebook page to make sure). I wouldn’t know but apparently, the brunch mac and cheese at Yeoman's Cask & Lion Pub is something to behold. Mac & cheese with sage sausage and bacon? Sign me up! For more great foodie finds in Tampa Bay, stay here at 813area. And be sure to register, it's free!